Ice hockey, snowboarding and figure skating are just a few of the 15 winter sports which will be on show during the 2014 Winter Olympics in Sochi, Russia. They are all extremely popular sports in their own right, but why are they not well-received here in the Emerald Isle? A common response is that our weather isn’t suited to them, but, in this day and age, those excuses bear no validity whatsoever. What about the UK for example? How come the sudden and welcome rise of ice hockey there hasn’t materialised here? Since the very first Winter Olympic Games were held at Chamonix, France in 1924, no country in the Southern Hemisphere has hosted the Games, so we are not alone in feeling isolated from the excitement of these sports. But why does it seem our neighbours across the water in the UK are making strides in the development of winter sports, while we lie stagnant? Why must we wait for the annual temporary ice-rinks to pop up at Christmas time for us to show even the most basic interest in such exciting sports? Ice hockey, which has a huge following in North America and parts of Europe too, has never really caught on in Ireland. The Irish Ice Hockey League consists of only five teams, all of which play their regular season games at the Dundalk Ice Dome, the first permanent ice arena in Ireland. Irish interest in the sport is decidedly limited, unlike the relatively popular ‘Elite Ice Hockey League’ in the UK. The UK league was founded in 2003, following the demise of the ‘Ice Hockey Superleague’. It consists of ten teams, with representation from all four countries of the UK. The current champions are the Belfast Giants, so even across the border the interest is far greater than anything we have seen down South. The logo of the Belfast Giants shows Fionn Mac Cumhaill, the famed hunter-warrior from Irish mythology, holding a hockey stick, which is perhaps a reference to the fact that most historians attribute the roots of hockey to games played in North Europe like shinty and hurling. To some, it seems like a matter of time before ice hockey (and subsequently other winter sports) piques the interest of the Irish. Perhaps we need a poster child to ignite the flare of winter passion? For a nearby example, just look at Amy Williams of the UK, who took gold in the skeleton at the 2010 Games in Vancouver and was the first British individual gold at the Winter Olympics for 30 years. Since then, she has been awarded an MBE by the Queen and been catapulted into the media spotlight. For those unaware, the skeleton involves an individual riding a small sled down a frozen track lying face down, during which time the athlete experiences forces up to 5g, or speeds of up to 125km/h. With events as thrilling and daring as this, it is surely inevitable that the winter sports craze will soon arrive here. Irish interest in the Winter Olympics began with the 1992 Albertville Games, when four Irish bobsledders competed. Since then, it is fair to say that our progress has been slow. At the 2010 Games in Vancouver, Ireland only had seven competitors taking part in four different sports. While we are never going to come anywhere near the likes of Norway, who have won the most medals (263) at the Winter Games, the hope is that Irish enthusiasm for winter sports will develop steadily over the next few years. Pat Hickey, the President of the Olympic Council of Ireland, said before the Turin Games of 2006 that “more and more Irish people are taking winter sport holidays, and this has fuelled the interest in a major way.” Ski resorts are more accommodating for Irish people now than ever and take in thousands of Irish visitors every year, and this trend shows no signs of slowing up. The usual temporary ice rinks are beginning to pop up in our major cities already, becoming a staple of the Christmas season. Although these rinks will only be used for recreational skating rather than anything competitive, the romantic aspect of these rinks in winter time cannot be ignored. These rinks can help inspire a child’s interest in skating in general and in winter sports in particular. Let’s hope the possible ice rink being proposed for the Santry National Ice Arena in Dublin will come to fruition so this fun can be experienced all year round in the capital. The Winter Olympics have provided some truly memorable sporting moments that astound us as well as bring a smile to our faces. Many remember British Winter Olympians Torvill and Dean, who became the highest scoring figure skaters of all time at the 1984 Games in Sarajevo. Who could forget the comically inept Eddie ‘The Eagle’ Edwards? The ‘so bad he’s good’ British ski-jumper from the ’88 Games in Calgary was the Olympic spirit personified. 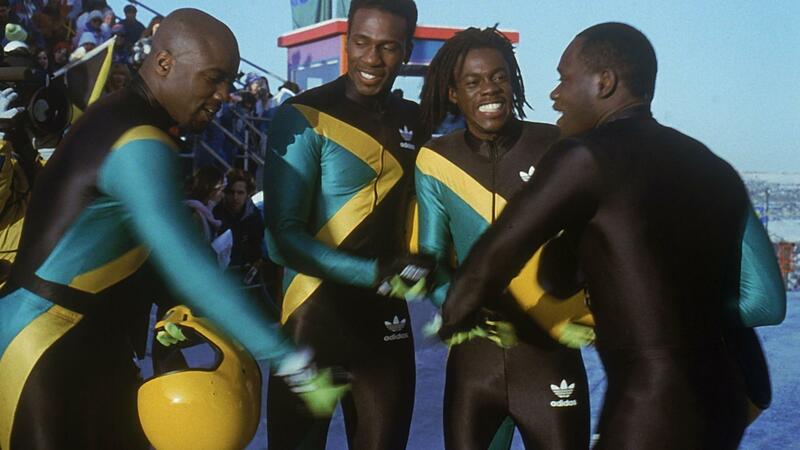 Perhaps the most well-known stars of the Games are, of course, the Jamaican bobsleigh team who were the crowd favourites in Calgary inspired the 1993 Disney picture ‘Cool Runnings’ starring the great John Candy. It is clear that winter sports can be incredibly entertaining. So come on Ireland, get out in the snow and have fun this winter. With such low levels of interest, who says you won’t be an Olympian?